In a small bowl, whisk the 1/2 cup of olive oil with the parsley, oregano, lemon zest and juice, the garlic and crushed red pepper. Season the gremolata with salt and black pepper. Light a grill and oil the grate. Brush the asparagus with olive oil and season with salt and black pepper. Grill over moderately high heat, turning, until lightly charred, 3 to 5 minutes. Transfer to a carving board and let cool; cut into 2-inch lengths. On a lightly oiled large baking sheet, stretch 1 ball of pizza dough to a 12-inch oval or round and brush with olive oil. Grill the dough over moderate heat until lightly charred on the bottom, 2 to 3 minutes. Flip the crust and scatter half each of the mozzarella and asparagus on top. Close the grill and cook until the cheese is melted and the crust is firm, 3 to 5 minutes. Transfer to a large board. Repeat with the remaining dough, mozzarella and asparagus. 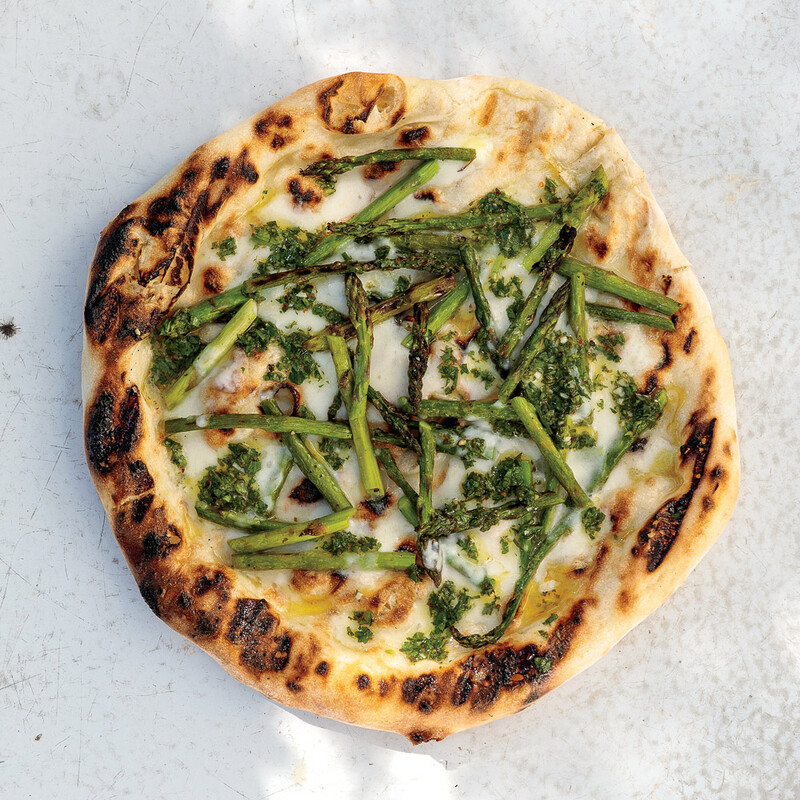 Drizzle the pizzas with the gremolata, cut into wedges and serve. Review Body: ***** This was so easy with the help of prepared pizza dough. The sauce was fantastic tasting. It turned out great! Yum Yum!